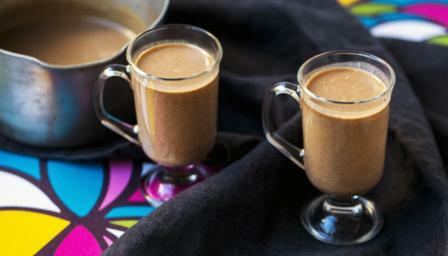 Hemsley + Hemsley’s low-sugar take on a bedtime drink is an indulgent night-time treat. This meal provides 130 kcal, 2g protein, 5g carbohydrate (of which 2g sugars), 11g fat (of which 10g saturates), 0.2g fibre and 0.2g salt per portion. Blend all of the ingredients and 300ml/10½fl oz water together in a food processor until super-smooth and well combined. Transfer the mixture to a pan and warm over a gentle heat.